The first flavors I pick up on the tongue is a faint sweet, followed by a lightly noticeable ginger, and touches of citrus lemon. The chewing brings on a more tangy vinegar, with graces of onion in the background. There's s light natural meat flavor that comes on towards the end of chewing. For being marketed as, "Paleo" and described as a "simple hint of honey & black pepper", I actually think that's fitting, because there's only a simple hint of honey and black pepper, just as what the company claimed. The sweetness of honey is actually more noticeable than its unique flavor, while the black pepper is just barely even there. 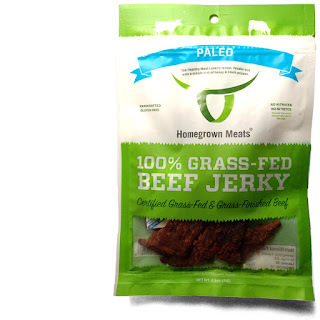 But for being marketed as, "Paleo", it certainly does taste like something more simple and Earthly. In fact, the natural meat flavors tend to come out pretty well, mostly towards the latter part of chewing, once the other seasonings and flavors wear off. Otherwise, the primary taste profile is a moderately sweet chew, noted by a light vinegar and lemon juice, lightly seasoned with ginger and onion, thus bringing out a noticeable natural meat flavor towards the end. The meat consistency looks to be slices of beef brisket, cut somewhat thin. Most of the slices in this sample are lean, though a few had some spots of fat. The fat has an aged character that generates a lot of beefy flavor when bitten into. Most of the pieces are easy to chew, yet offer up a moderate chewiness. Once chewed down soft, they take on a very meaty, almost steak-like texture. Some stringiness is noted. 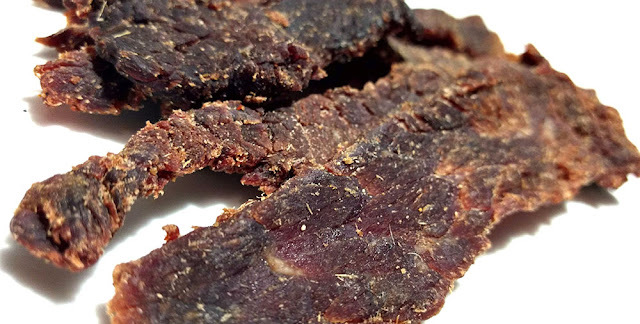 This Paleo beef jerky from Homegrown Meats definitely brings on a more natural character by eliminating the soy sauce and worcestershire that many brands tend to rely on. What's left is a flavor that tastes more simple, and more Earthly. 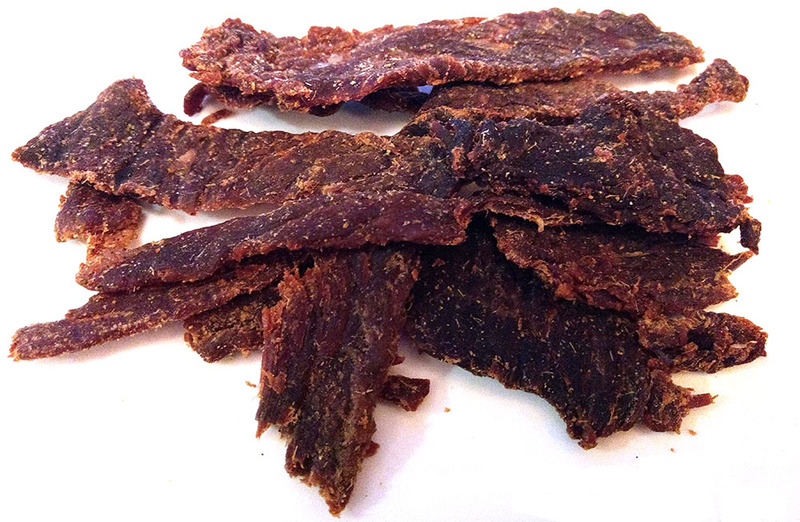 This is still, however, a jerky that's quite sweet through a more generous helping of honey. But if you can get past that, Homegrown Meats has managed to create a meat snack that tastes light and brings out more of Beef's natural goodness. It's largely a dash of vinegar and lemon juice with a noticeable ginger and onion and seasoning. It's actually quite good because it creates a unique overall profile while retaining a light, airy character that helps bring out the natural meat flavors.